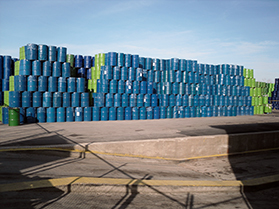 Honey Solutions receives this precious commodity in 55 gallon drums. 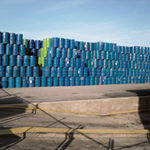 The honey is supplied from domestic beekeepers and international honey collectors located in North America, Europe, South America, and Southeast Asia …all from C-TPAT validated facilities. 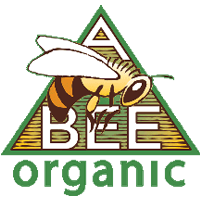 All of our Raw honey is received, sampled and subsequently quality tested before use. 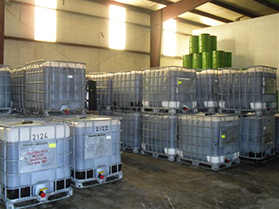 In order to pack a USDA Grade A approved and shelf-stable product that achieves our customers’ stringent quality specifications, we gently heat the product before blending and packing. Our honey is heated in order to: properly filter all foreign matter out (retaining most of the pollen), melt honey crystals and to maintain low microbiological profiles. 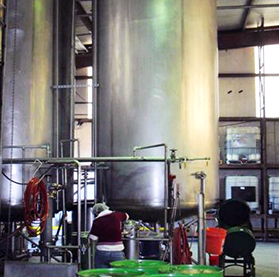 Importantly, our manufacturing process leaves materially all of the pollen in the honey. 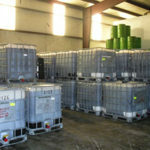 Why is retaining the native pollen important? Pollen present in the honey is important for nutrition, for purity and for confirming origin (both geographic and varietal). 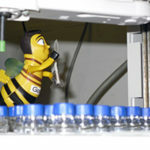 First Pollen provides unique nutritional value containing peptides, amino acids, minerals and vitamins. Second, native pollens provide forensic geographical evidence of where the bees found the honey and Third, the ratio of the native pollen types can identify if the honey has been altered or blended. That is why our honey is minimally processed to protect the native Pollen content and the honey’s natural goodness! 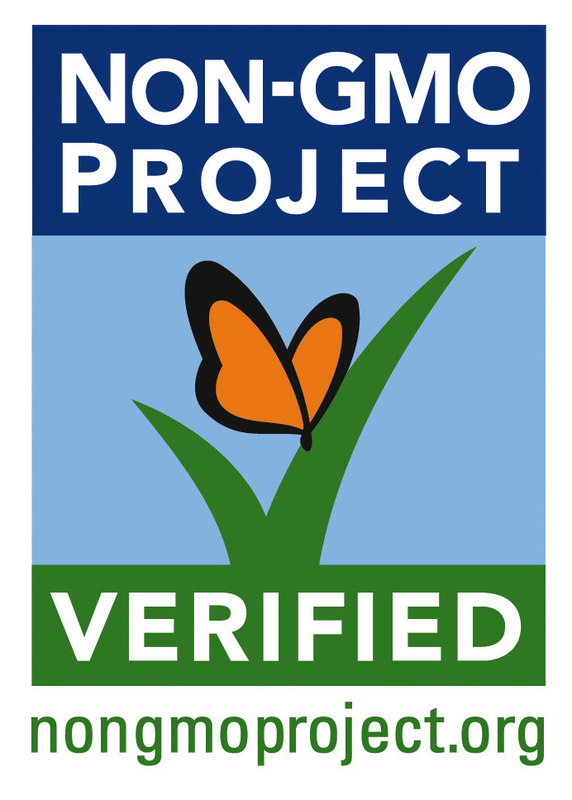 Honey Solution’s products are certified Kosher by Orthodox Union Jewish Congregations of America. It also holds a Passover OUP certification. 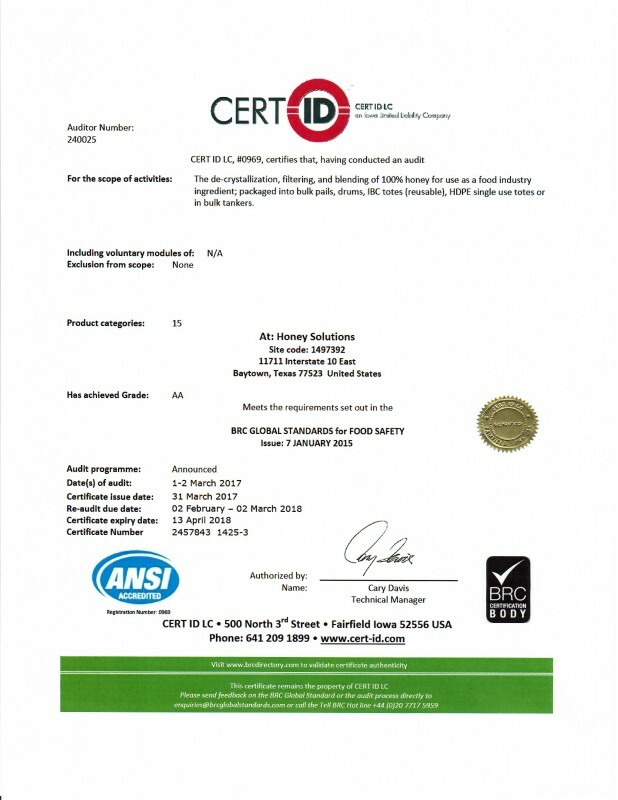 Honey Solutions facilities are currently GFSI approved and CERTIFIED by the BRC Food Standard Version 7 and currently sustains an AA rating in facility audits. 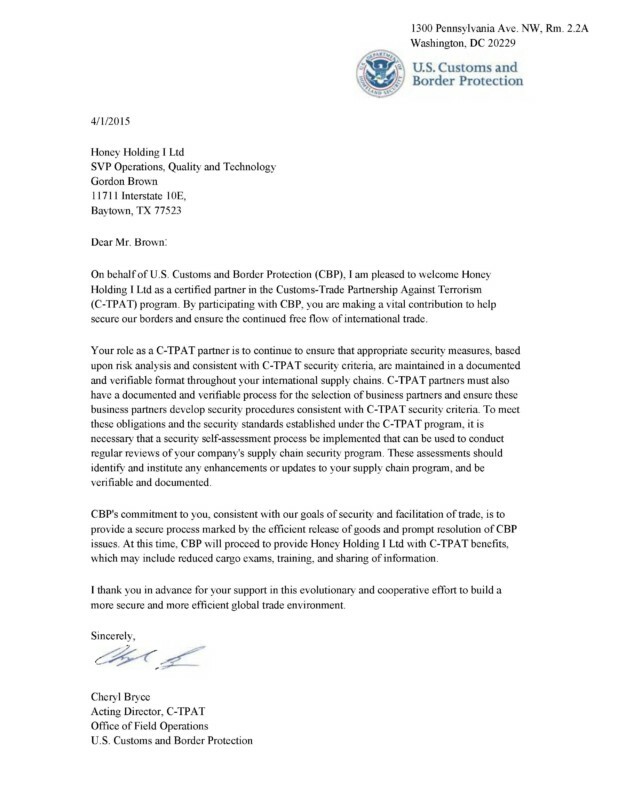 Honey Solutions is a certified partner with US Customs CBP through is C-TPAT network Customs-Trade Partnership Against Terrorism and and are audited annually in this program. 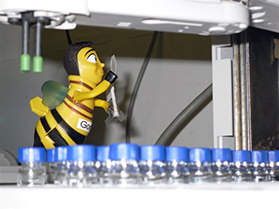 Each lot of Honey is Country Of Origin Verified by third party labs using pollen analysis. 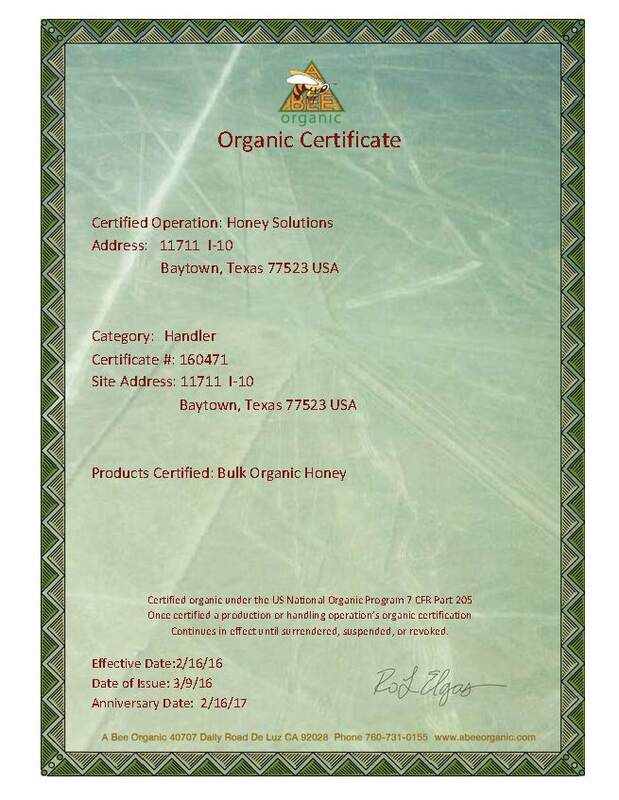 Honey Solutions is certified Organic Honey Handler under the National Organic Program.